Under the SOVERON brand, Rohde & Schwarz will present SOVERON D, SOVERON VR, SOVERON HR, SOVERON AR. At IDEX 2019 in Abu Dhabi, Rohde & Schwarz will demonstrate its proficiency as a system partner and integrator for planning, developing, manufacturing and implementing secure communications architectures and networks. Under the SOVERON banner, the German technology group offers system solutions capable of integrating key components from Rohde & Schwarz as well as products from other suppliers. In addition to an innovative portfolio of interoperable, high-performance communications systems for deployment on land, in the air and at sea, Rohde & Schwarz will exhibit tactical and strategic intelligence systems, with a special focus on its fully digital ELINT solution. Ethernet encryption solutions round out the company’s trade show presentation. At IDEX 2019 in Abu Dhabi from 17 to 21 February 2019, Rohde & Schwarz will present SOVERON, a holistic system solution that provides government customers with a secure, high-performance network architecture based on state-of-the-art hardware and software, thus creating national digital sovereignty and technological independence. As key components of the SOVERON architecture, Rohde & Schwarz will present its innovative SOVERON software defined radios (SDR) for tactical communications scenarios and for deployment on airborne platforms. The Rohde & Schwarz SDR family includes SOVERON D, which is the product created under the joint radio system project of the German Armed Forces (SVFuA). For these software defined radios, the company has designed high data rate, anti-jam waveforms to match diverse mission requirements. For every communications scenario, users can select the waveform and encryption that best suit their requirements in terms of range, data rate and jam resistance. Also at IDEX, Rohde & Schwarz will showcase its R&S NAVICS integrated communications system for internal and external communications on board all classes of ships. Relying on commercial IT technology to a large extent, the system is especially cost-effective, and its modern graphical user interface (GUI) makes it intuitive to operate. Stationary and mobile voice terminals ensure uninterrupted communications everywhere on board the ship. The system is fully IP based, allowing the integration of further communications services such as video over IP, broadcast, alarm functions and shipborne telephone systems. Another highlight that will be on display is the Rohde & Schwarz ELINT solution. The system offers exceptional ease of operation and comprehensive functionality, and has been optimized for detecting, recording and analyzing modern radar signals. It is designed to handle challenging signal scenarios and has already proven its value in operation, especially when it comes to acquiring weak and LPI signals in dense signal environments and analyzing state-of-the-art multifunction radars with complex signal structures. 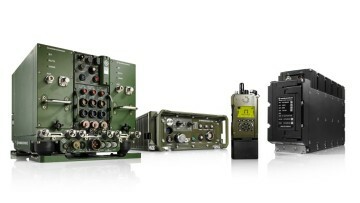 The ELINT system is modular and scalable and can be deployed on a variety of platforms. Secure voice and data communications is a vital prerequisite for successful digital transformation. To effectively protect networks and critical infrastructures against attacks, Rohde & Schwarz has developed a broad range of hardware and software products that counter attacks proactively rather than reactively. Among these are Ethernet encryption solutions that protect authorities, organizations and enterprises against espionage and data manipulation. The Rohde & Schwarz network encryption devices are approved by the German Federal Office for Information Security (BSI) and can be used flexibly with many stationary and mobile applications. Rohde & Schwarz will showcase its secure communications and cybersecurity portfolio at IDEX 2019 in Abu Dhabi in hall 8, German Pavilion, booth C19. SOVERON ® is a registered trademark of Rohde & Schwarz GmbH & Co. KG.